Mother’s day is just around the corner, so get ready to spoil the most important woman in your life! Whether she’s pretty tricky to buy for, or you’re on a budget, I’ve found some little gems that are guaranteed to be perfect Mother’s Day Gifts. DKNY are the masters of creating a scent that is vibrant, fresh and feminine and with DKNY Women some surprising ingredients are used to achieve this (Who’d have ever thought Vodka would be an ingredient that would make you smell nice?!) DKNY describe it as a fragrance that captures the fast paced atmosphere in New York city, but don’t let this put you off, it isn’t just for the young. It has an assured femininity that is reinforced by the base notes of Coral Orchid, Water Lily and Daffodil. Moisturise the skin with the soothing and pampering body lotion and spritz the Eau de Parfum for a longer lasting essence. 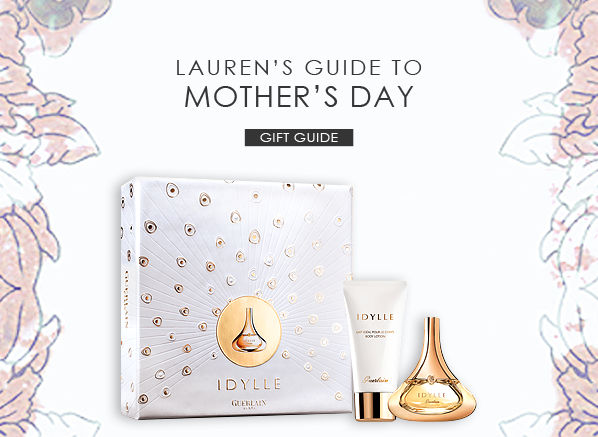 Guerlain know a thing or two about perfume, they never fail to release a perfume that doesn’t become a best seller or firm favourite and with Idylle there is no exception. This gift set features the Eau de Toilette version of this well loved fragrance. It’s slightly lighter and livelier than its sister but still has that fresh floral bouquet that is like walking into a summer garden. Not only do you get a 35ml Eau de Toilette but you also have a 75ml body lotion to really reinforce the fragrance for an exquisite all day scent. These soaps are a great idea if you’re not really sure what to get your mum. They’re individually wrapped and as there is a selection of 4 of their best selling scents she’s bound to find one that she falls in love with. Enriched with Shea Butter and other moisturising oils, they help to cleanse but also keep the skin soft. My mum absolutely loves Crabtree & Evelyn and the La Source range is her favourite. I thought I’d buy her a little selection of the products and get her the Traveller Gift Set seeing as she’s always jetting away somewhere nice (it’s alright for some!). It has a lovely relaxing spa smell and even when she isn’t away on holiday the sea air fragrance helps to take her back there! It’s perfect for taking away with you as they are handy sizes and come in a beautiful ‘weekend’ bag for easy storage. Mother’s Day presents don’t have to be big, flashy and expensive. Mums are great and they’re just as happy receiving a present that may not break the bank but has had a lot of thought behind it than they are receiving a gift that is bordering on ostentatious. Tell her you love her, that you appreciate her and that she’s a great mum and I can guarantee that that’ll be the best present she could ever get! I ordered the DKNY Women's Gift Set recently. This was my first purchase via Escentual. Firstly, I was really pleased with the cost of the set because clearly it was a real bargain. I placed my order easily and expected to wait for at least a couple of weeks before it arrived. On arrival home a few days later there it was! Not only did it arrive much quicker than anticipated, it was in perfect condition and is such good value for money. I absolutely love the smell of this perfume and the added bonus of the body creme makes it a perfect buy. A true gift for anyone or, more importantly, for yourself!!! This entry was posted on Wednesday, February 27th, 2013 at 9:00 am and is filed under Gifts, Guest bloggers. You can follow any responses to this entry through the RSS 2.0 feed. You can skip to the end and leave a response. Pinging is currently not allowed.